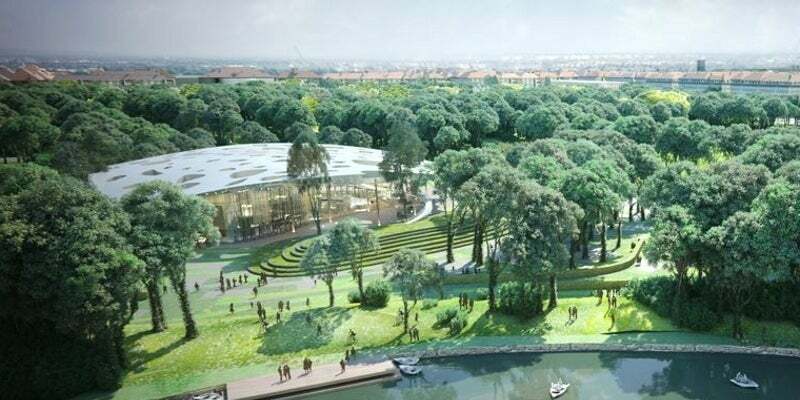 House of Hungarian Music will be developed as part of Hungarian Government’s cultural rehabilitation plan for Budapest’s Liget Park. Image courtesy of Városliget Zrt. A skylight and openings in the roof will allow natural lighting. Image courtesy of Városliget Zrt. Visitors will be able to indulge in a permanent exhibition that will highlight the Hungarian music history. Image courtesy of Liget Budapest. The design was inspired by the wave form of the sound. Image courtesy of Liget Budapest. The venue will feature a floating roof placed above a translucent pavilion that resembles a musical wave. Image courtesy of Liget Budapest. Sou Fujimoto Architects’ design was chosen for the House of Hungarian Music through an international competition. Image courtesy of Liget Budapest. House of Hungarian Music or the Bartók Centre is a proposed music venue that will be developed as part of Hungarian Government’s cultural rehabilitation plan for Budapest’s Liget Park. Japanese firm Sou Fujimoto Architects have been selected to design the venue through an international competition. The musical institution is conceived as a place to exhibit Hungarian music history, folk music and music education, along with providing visitors an interactive experience. Located in the City Park, close to the Vajdahunyad Castle and the ice rink, the new structure will be constructed on a site currently occupied by abandoned office buildings. Development of the music house will start in 2015 after the demolition of the existing buildings, with construction scheduled to begin in 2016. The facility will be open to public in early 2018. Envisaged as a transparent building that interacts with its surroundings, the music venue will feature a floating roof placed above a translucent pavilion that resembles a musical wave. Inspiration for the design has been drawn from the wave form of the sound, and the architecture imbibes it in its varying and undulating structure. The floating roof shape has been designed as a non-directional round form that will attract and invite visitors from all directions of the park. The building’s shape imbibes its surroundings and resembles the trees. Its circular volume gently rises while turning in all directions and creating a free ground floor. The perforations of the structure allow in natural light similar to the sun rays filtering through the forest leaves. The building will be segmented into three levels that will resemble three parts of a music sheet and have different and varied functions. The building has been structurally divided vertically into three zones, namely the floating roof, the ground floor and the basement. The framework of the floating roof consists of trusses that strengthen the structure by contributing in a three-dimensional style. Thin, randomly-positioned columns on the ground floor support the roof and create an echo that is similar to that of the surrounding tree trunks. The core is sheathed in reflective material to lend a transparent appeal to the ground floor. Vertical load from above is carried to the foundation and the horizontal load is supported by the retaining walls on the perimeter through the ground floor slab, ensuring a simple and economical basement design. Visitors to the venue will be able to indulge in a permanent exhibition that will highlight the Hungarian music history and a temporary exhibition that will focus on varied segments of music, and numerous other events. The permanent exhibition is held in a large open space that receives abundant light from the skylight dome that adds to the openness and visitor experience while moving through the hall. Design of the temporary exhibition space is identical to black box and can be divided into segments via mobile walls. Concerts and dance houses will also be organised at the Hungarian House of Music. A palace of musical wonders will be located at the ground level that will offer an interactive experience to the visitors through innovative installations and applications. Community events and concerts will be held at the mid level, while the top level will house lecture halls and an experimental musical centre. At the centre of the building will be a large entrance hall that will provide easy navigation and orientation for the visitors. An event hall will be located on the west side of the building close to the outdoor stage. It is designed to offer a place for listening to music, from natural music concert, intimate concert, live performance, amplified music to other activities. "The musical institution is conceived as a place to exhibit Hungarian music history, folk music and music education." A lecture hall will be present in continuation to the entrance consisting of theatre style seating that will offer audience great accessibility and visibility. The lecture hall will be used to hosts lectures, conferences, small plays and film projections. Lying at the centre of the venue will be the planned landscape that imitates the waves of the sound. The pavements are designed to fuse together with lawns and planted areas creating an impression of nature taking over. The landscape creates various spaces and extensions of the music house that are spread all around the park. The building features a smart roof that provides sun shading for the event spaces on the ground floor and the exhibition spaces in the basement. A skylight, as well as openings are present in the roof that allow natural lighting and ventilation of the learning spaces on first floor and the event spaces and entrances on the ground floor. Service and mechanical rooms are designed on the periphery of the roof with openings for cooling and ventilation. Wind catchers will be installed on the roof top to increase natural ventilation. Enthalpy heat exchangers will be included for providing ventilation for rooms. Rainwater will be harvested through an advanced water management system, providing multiple benefits and cost savings.